A 42in plasma for £1,300? What's the catch? The picture's good, but it's the price that'll make you buy it. Even given Hitachi's reputation for aggressively priced, good quality plasmas, this TV's £1,300 might lead you to wonder what's been left out. The answer is nothing. The set's simple black chassis is far more stylish than its peers in this price range, marking the set out. Even though at 42in, the set was already standing some way apart. The sockets don't disappoint, but they don't excite either. An HDMI jack (two would have been welcome) and component video inputs handle the high-definition side of things, while three Scarts (two RGB capable) and a subwoofer line out are the remaining highlights. Hitachi claims this display has a resolution of 1024 x 1024, but this is down to the Alternate Lighting of Surfaces system. ALiS is a way of doubling the vertical pixel count by switching between two images, but this only matters to AV hardware fanatics. The ALiS-boosted pixel count earns this set an HD-ready badge, and provides an excellent high-definition picture. Where this TV falls down is with standard-definition footage. 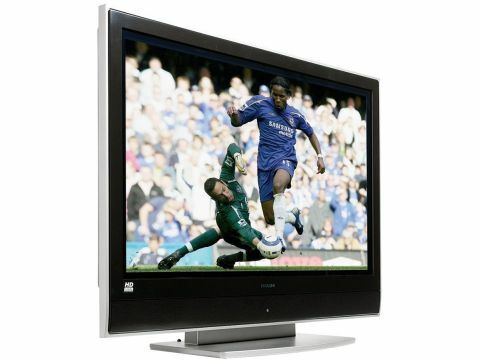 Other Hitachi plasmas come with the Picture Master system to boost the display's picture quality. This set doesn't and the lack of the image processor is felt. The three classic plasma faults appear when watching standard-definition footage: dot crawl, pixels breaking up, and colour banding. These problems aren't bad, but shouldn't be present. Regular TV also looks slightly soft. Despite these problems the pictures are far from dreadful - the set has an extremely wide contrast range, giving detailed and deep blacks, natural colours and little noise. High-definition images are also impressive - textured and vivid. The audio performance isn't bad, with clean midtones and a reasonable bass (which can be given a boost thanks to the subwoofer line out). With its impressive high-definition performance, and fair SD images, this 42in plasma makes a good impression. But it's the £1,300 price tag that makes this set one that you should have on your shortlist.